May is a month for appreciation. Appreciation of Spring, new beginnings, academic endings, individuals who have given their lives in war, and last but certainly not least, Mothers. We’ve all got one. For better or worse, these strong women who brought us into the world should be appreciated for the sacrifice they made to give us life. Even those of us who feel a bit disillusioned by the world, or overwhelmed by its troubles, can usually find at some point or another a reason to be thankful we are in it. If we are lucky (and appreciative and resilient), we find reason often. This pie was baked for a mother. Not my own, but she might as well be. That’s perhaps the coolest part about mothers – so many of them are happy to share their mother-ness with many, many more than just their own offspring. How lucky for those of us who have benefited from the love of a mother who is not our own! The way I see it, gathering multiple “moms” into my life is sort of like taking out an insurance policy. There will be no shortage of love, care packages, support, cookies, and hugs when times get tough. And when times are good? There will be no shortage of love, care packages, support, cookies, and hugs. Really, I can’t find anything wrong with having lots of moms. And I have yet to meet a mom who isn’t happy to unofficially adopt another kid or two. The other coolest thing about moms? They’re so very easily pleased! Lose a tooth, grow an inch, eat some broccoli, sing a song, smear some paint on a piece of paper… Moms are either really good actresses or they genuinely think everything you do is the bee’s knees. I’d like to think it’s [usually] the latter. Now that finger paintings and loose teeth are in short supply, I’ve found new avenues by which to please the moms in my life. As the mom in whose honor this pie was prepared took the first few bites, she proclaimed it brought her close to tears. Yep, they may just be really good actresses, but there’s still nothing like a mom’s approval to make you smile. 1 9″ pie crust (halve this flaky butter crust recipe, or just make the whole thing and freeze half for later. Pie crust is best when very chilled. You can make it the night before or several hours in advance). Roll out the crust on a well-floured surface. To transfer to your pie dish, gently fold in half, then half again and place in the dish. Unfold and press firmly into the bottom. Trim the sides until there is about an inch of overhang. Fold under and press firmly into the dish. You can crimp the rims by pinching a finger and thumb together and pressing the dough with the finger of your other hand. Place pie dish in the freezer to chill. Preheat oven to 400°F. After you’ve made your crust (best if made the night before or several hours in advance and then chilled in refrigerator or freezerCombine sugar, flour, and salt. Add sour cream, egg, vanilla, and nutmeg. Peel and slice peaches. 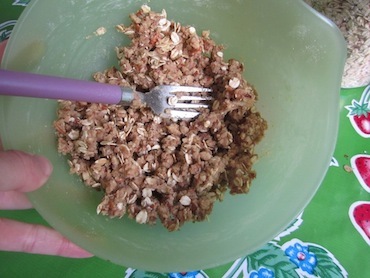 Add to sour cream mixture. Pour fruit mixture into unbaked pie crust. Bake at 400°F for 10 minutes. Reduce heat to 350°F and bake for 30 minutes more. Now make your crumble topping. Combine all ingredients until well moistened. 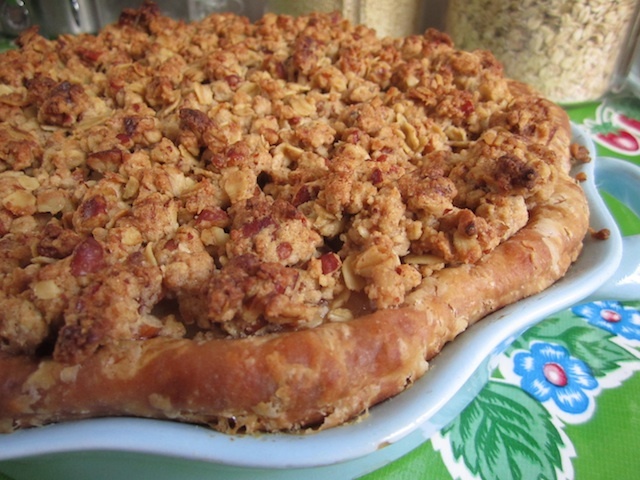 When pie has baked at 350°F for 30 minutes, remove from oven and sprinkle crumble topping evenly on top. Raise heat to 400°F and immediately place pie back into the oven. Bake for 15 minutes. Let cool before serving. 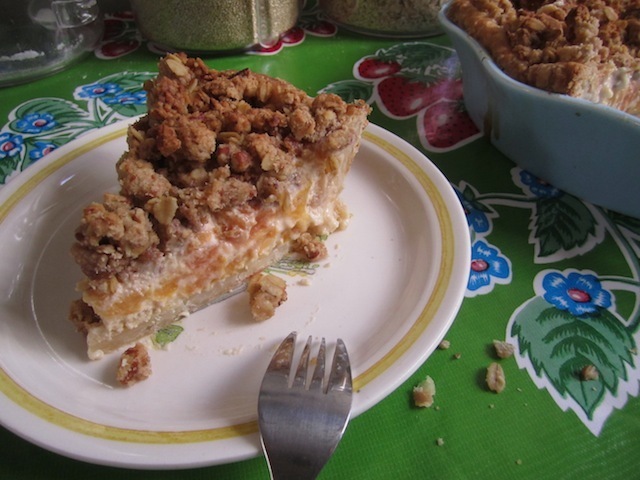 This entry was posted in Pie and tagged crumble, maple, peach, pecan, pie, sour cream. Bookmark the permalink. Your thoughts are all so true! We all have to be thankful! 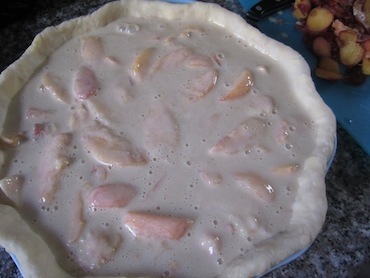 Your pie looks so delicious and peach being one of my favorite pies, I’ll think of your words when I make this! As ‘the mom’ that this pie was made for, I must thank you once again for this sweet, thoughtful gesture. There was no acting involved as it truly brought me to tears to have someone take the time and effort to make something so special for me! I do consider you as ‘mine,’ and I am truly blessed to have you in my life. We moms have more than enough love to go around are happy to share it, especially with someone as special as you.